easy recipe and method to make nankhatais with atta or whole wheat flour. 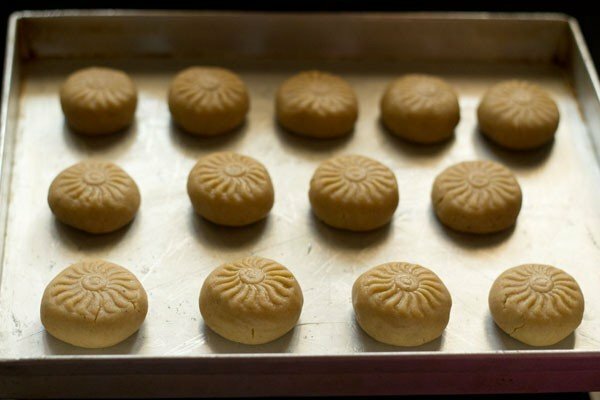 whole wheat nankhatai recipe with step by step photos . nankhatai are basically indian shortbread cookies. 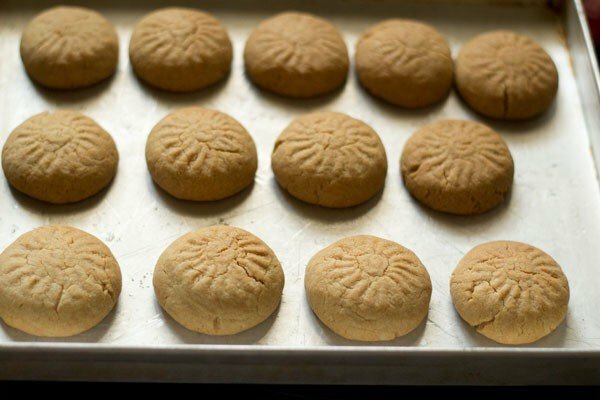 the recipe shared in this post shows how to make nankhatai with whole wheat flour or atta. sharing these nankhatais made with whole wheat flour as i had got a few requests for the recipe. i have already posted the nankhatai recipe made with all purpose flour or maida. wherever possible, i prefer to bake cookies and cakes using whole wheat flour. these nankhatais are not as crumbly as the ones made with all purpose flour but they taste good. of course they taste like nankhatais made with whole wheat flour. 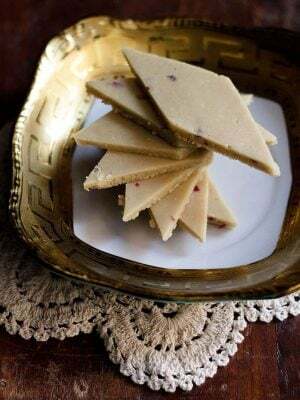 you do get the nutty taste of wheat flour in these indian shortbread cookies. since they are made from atta, they are a better alternative than nankhatais made with all purpose flour. i have also added besan to give some crumbly texture. the recipe yields 300 grams nankhatai or 14 to 15 medium sized nankhatais. the recipe can be doubled too. 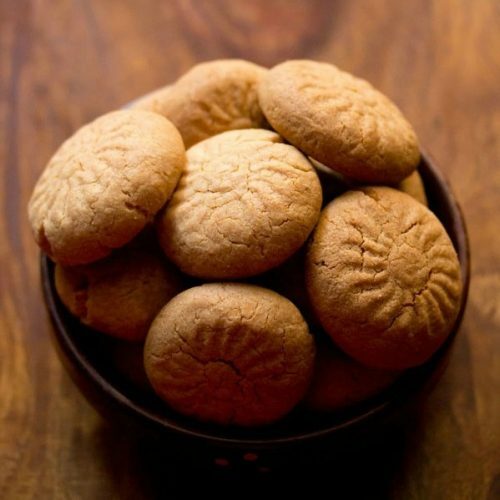 make these whole wheat nankhatais this diwali and serve them as a tea time cookie snack. 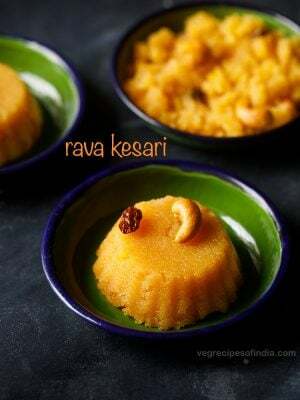 if you are looking for more diwali snacks recipes then do check karanji, butter murukku, shankarpali, khandvi, mysore pak and corn flakes chivda recipe. 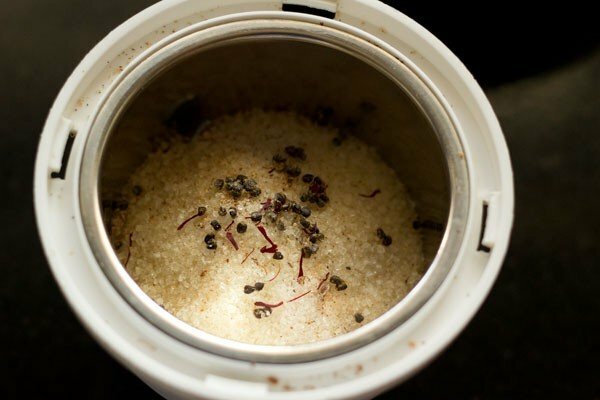 in a grinder jar, take 1/3 cup sugar (70 grams), seeds from 4 to 5 green cardamoms, a pinch of safron strands and 1/8 tsp grated nutmeg. grind to a fine powder. keep aside. if you have powdered sugar already, then use 1/2 cup of powdered sugar. grease a tray or pan very well with 1 to 2 tsp butter or ghee. also preheat oven to 180 degrees celsius/356 degrees fahrenheit. 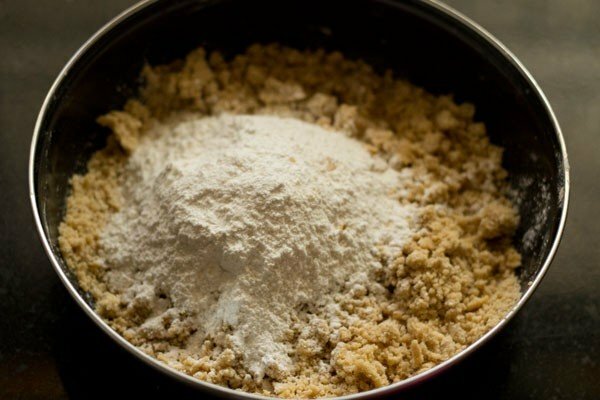 in a seive, take 1 cup whole wheat flour (atta), 2 tbsp besan and 1/4 tsp baking soda. add 1/4 tsp baking powder if you do not have baking soda. 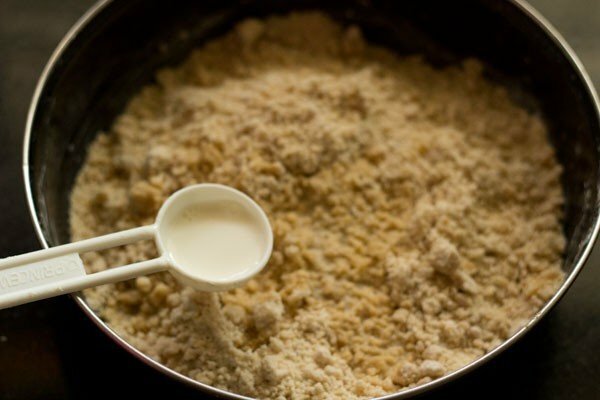 sift the dry mixture very well in a mixing bowl or pan. to the sifted flour mixture add approx 1/2 cup or 70 grams of cold or chilled butter. you can also use 1/2 cup of ghee in semi solid state. 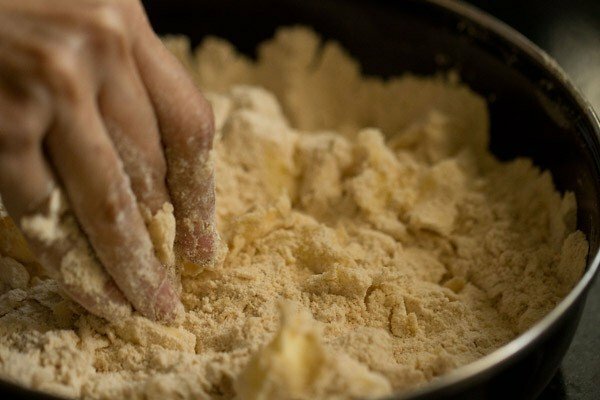 with your fingertips break the butter and mix with the flour. you can cut the butter in the flour with two knives too. this can also be achieved with a food processor or a stand mixer. if the butter melts while mixing with your hands, then its fine. 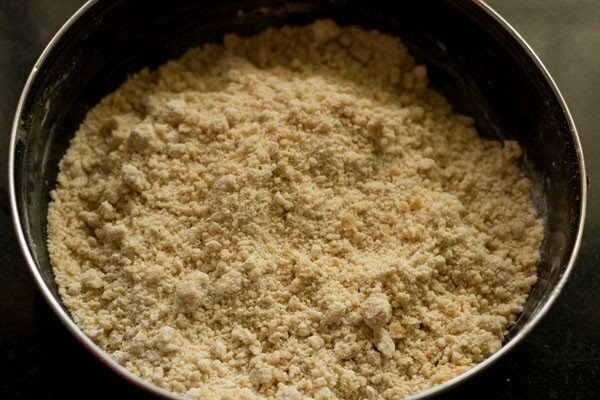 mix till you get a bread crumb like texture in the mixture. now add the powdered sugar and lightly mix with your hands. add 1 to 2 tbsp milk. the amount of milk to be added depends on the quality of flour. the mixture should be able to come together and hold itself. if required you can also add overall 3 to 4 tbsp of milk. i added 2 tbsp milk. add the milk in parts and mix. gently bring together the nankhatai dough into a ball. do not knead the dough. just gently mix. 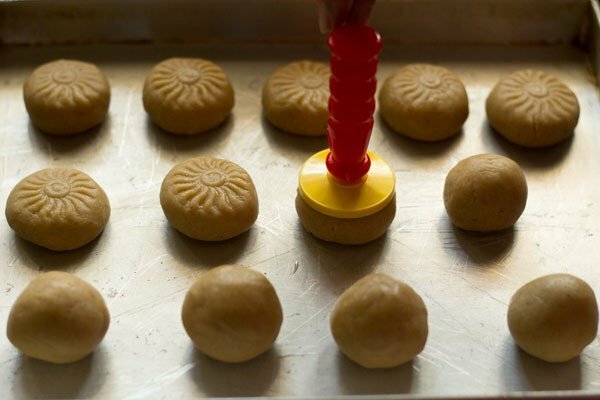 now pinch small or medium sized balls from the nankhatai dough and lightly roll them. place the balls on the greased baking tray. you can gently press them to flatten them. you can also make designs on them with a fork or toothpick. i used a peda design maker to lightly flatten as well as to give a pattern on the top. bake the nankhatai in the pre heated oven at 180 degrees C/356 degrees fahrenheit for 20-25 mins till light golden or golden. since oven temperatures vary, it may takes less or more time. so do keep a check. after 2 to 3 minutes, remove them from the tray and keep on a wire rack for cooling. when cooled at room temperature, store nankhatai in an air tight jar. 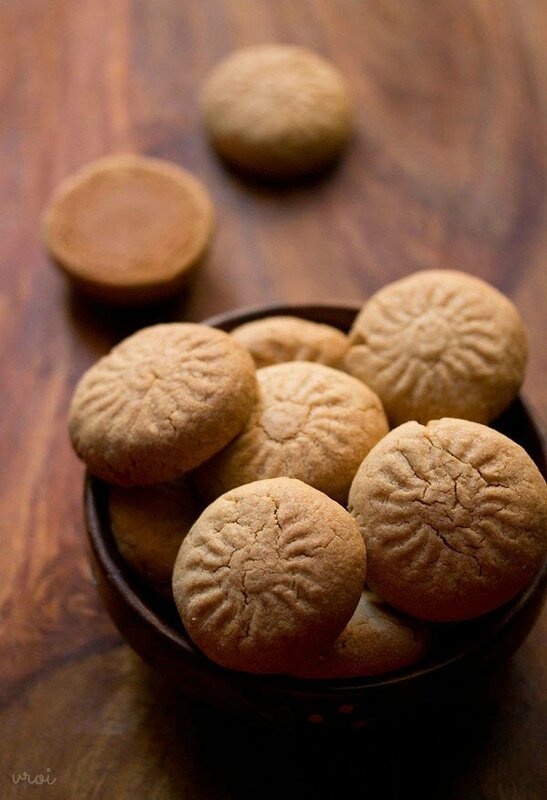 serve whole wheat nankhatai as a tea time cookie. 1. in a grinder jar, take ⅓ cup sugar (70 grams), seeds from 4 to 5 green cardamoms, a pinch of saffron strands and ⅛ tsp grated nutmeg. 2. grind to a fine powder. keep aside. 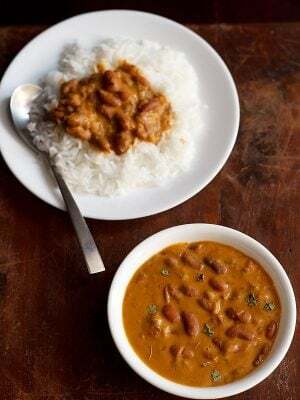 if you have powdered sugar already, then use ½ cup of powdered sugar along with ½ tsp of cardamom powder, ⅛ tsp grated nutmeg and crushed saffron strands. 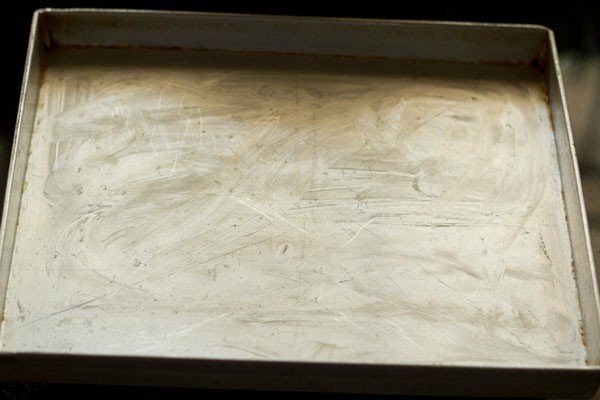 3. grease a tray or pan very well with 1 to 2 teaspoon butter or ghee. also preheat oven to 180 degrees celsius/356 degrees fahrenheit. the oven should be preheated 15 minutes before baking. 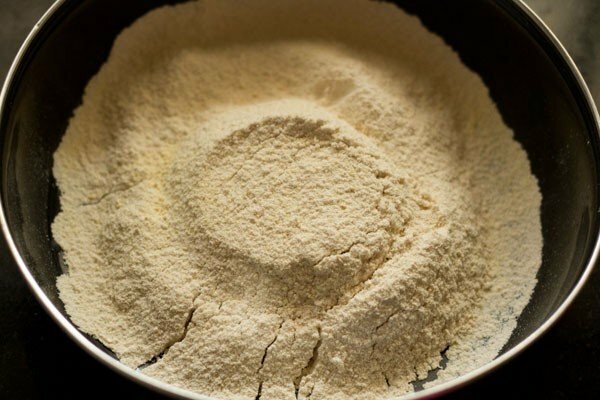 4. in a seive, take 1 cup whole wheat flour (atta), 2 tbsp besan and ¼ tsp baking soda. add ¼ tsp baking powder if you do not have baking soda. you can also add a pinch of salt at this step, if using unsalted butter or ghee. if using salted butter then skip adding salt. 5. sift the dry mixture very well in a mixing bowl or pan. 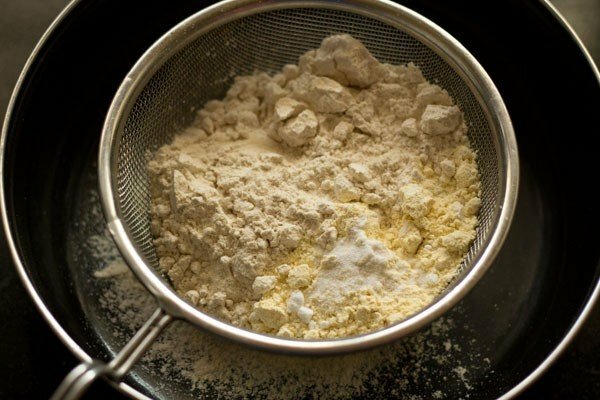 6. to the sifted flour mixture add approx ½ cup or 70 grams of cold or chilled butter. you can also use ½ cup of ghee in semi solid state. 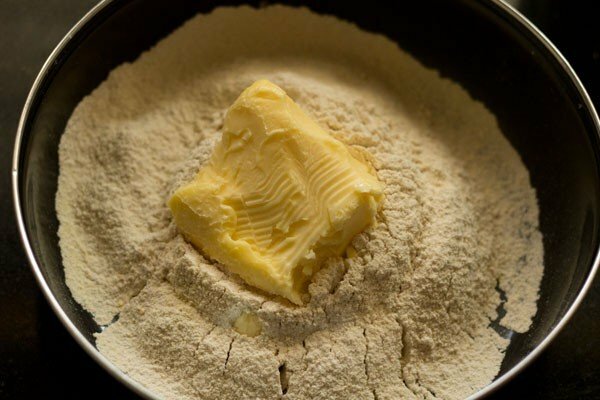 7. with your fingertips break the butter and mix with the flour. you can cut the butter in the flour with two knives too. this can also be achieved with a food processor or a stand mixer. if the butter melts while mixing with your hands, then its fine. 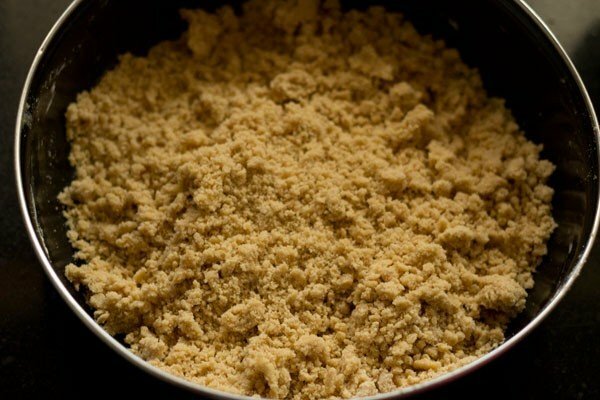 8. mix till you get a bread crumb like texture in the mixture. 9. now add the powdered sugar. 10. lightly mix with your hands. 11. add 1 to 2 tbsp milk. the amount of milk to be added depends on the quality of flour. 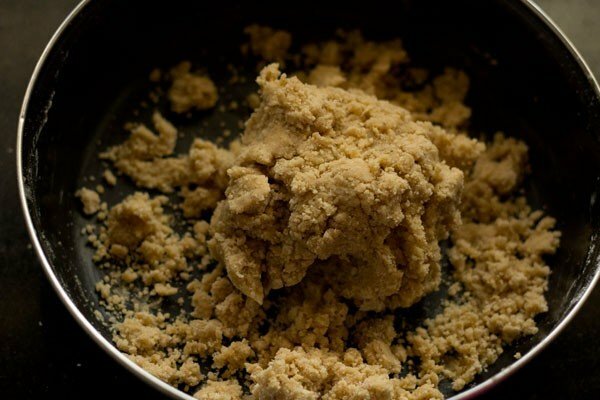 the mixture should be able to come together and hold easily. if required you can also add overall 3 to 4 tbsp of milk. i added 2 tbsp milk. add the milk in parts and mix. 12. gently bring together the dough into a ball. 13. do not knead the dough. just gently mix and gather the mixture to a dough. 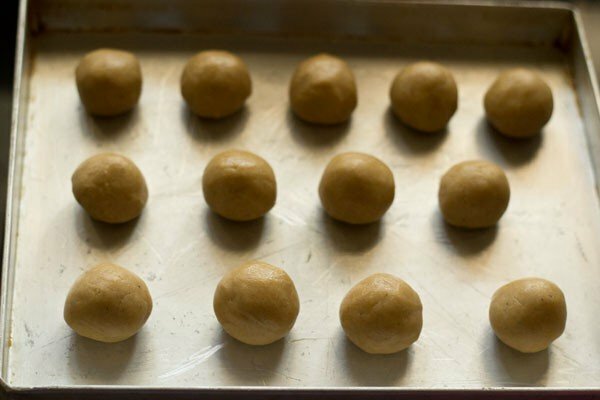 14. now pinch small or medium sized balls from the nankhatai dough and lightly roll them. place the balls on the greased baking tray. 15. you can gently press them to flatten them. you can also make designs on them with a fork or toothpick. i used a peda design maker to lightly flatten as well as to give a pattern on the top. 16. here is the nankhatai tray ready to go in the oven. if you want you can sprinkle and lightly press some chopped dry fruits like pistachios, almonds etc from the top. 17. bake the nankhatai in the pre heated oven at 180 degrees C/356 degrees fahrenheit for 20-25 mins till light golden or golden. since oven temperatures vary, it may takes less or more time. so do keep a check. once baked, after 2 to 3 minutes, remove them from the tray and keep on a wire rack for cooling. don’t brown them too much as then they the crust becomes too dense and hard. a light golden color on the top keeps them soft and crumbly. for convection ovens use the pre heating and baking temperature of 160 degrees celsius/320 degrees fahrenheit. 18. when cooled at room temperature, store them in an air tight jar. 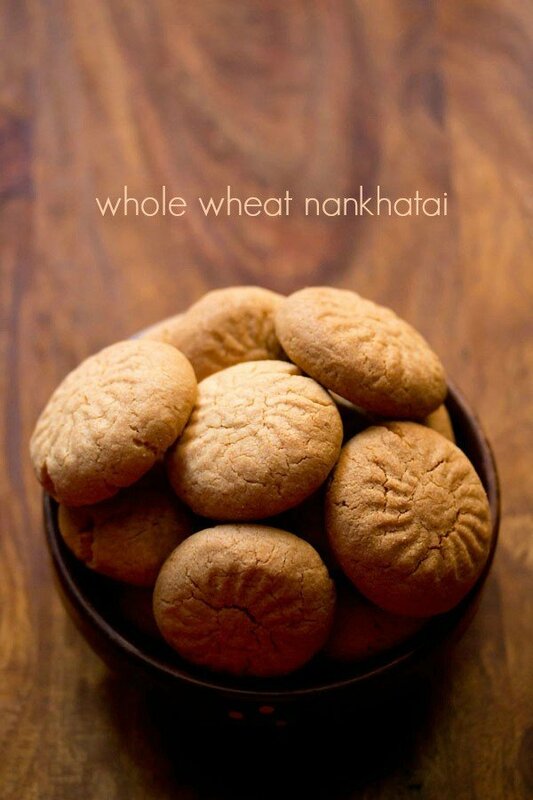 serve whole wheat nankhatai as a tea time cookie. Hello ma’am. Awesome recipe. My mom and brother loves nankhatai a lot. But in market we mostly get made of maida. But they loved wheat nankhatai a lot and a lot. Thanks a ton. My question is as they both are diabetic can you please help me with some suggestions for it. thanks manisha for this feedback. using the same recipe you can make namkeen khatais like adding jeera or ajwain, salt and spice powders. this way you don’t need to add any sugar. another option is to use a fruit based puree like an apple puree and skip sugar. but with a fruit puree the texture can be soft. Hi Dassana, please tell mi what is besan, and where can i find it? 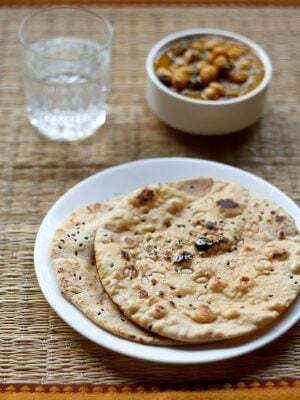 judith, besan is gram flour made from husked black & split chickpeas. 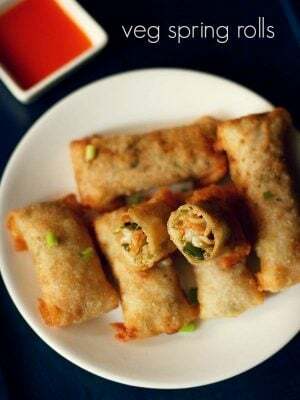 you can use chickpea flour instead. chickpea flour will be easily available in any grocery stores in US. you will get besan in indian grocery stores. Ur recipes are awesome. I do not have an oven can we have any other alternative?? 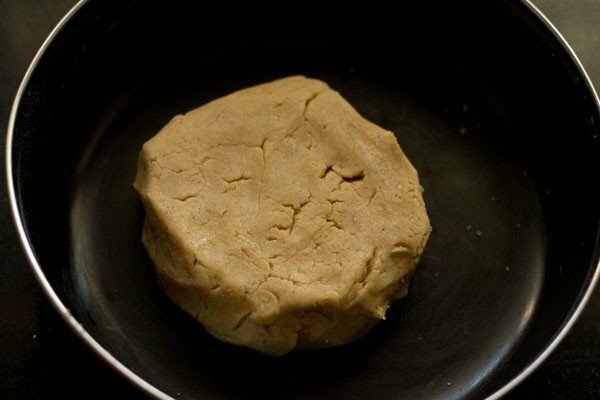 instead of cake batter in a pan, place nankhatai on a greased plate or pan in the pressure cooker. I have practically learnt cooking from your website. Your explanations along with pictures and small side notes are the most helpful way of trying new recipes with almost nil error. 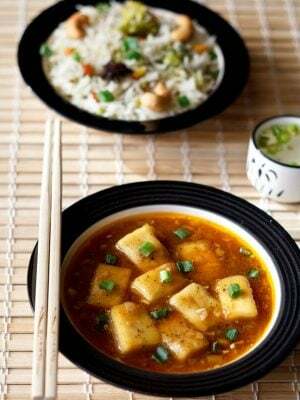 My question for this recipe is can I substitute sugar with Jaggery, if so same quantity? Also can you please post some recipes for baby finger foods without salt, sugar and milk. thank you priyanka. you can add jaggery and in the same quantity as sugar. if adding jaggery, you may need to add less milk as there is some moisture in jaggery. i will try to add these recipes. 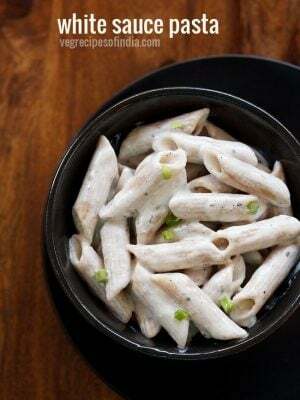 I have made it various times with few variations too and this is the best recipe ever. Never fails, very forgiving and easy for new bakers like me. My question is, if I want to reduce sugar (like half the quantity), do I need to make other changes in the recipe? thank you garima. yes if the sugar is reduced then some more changes will be required. apart from making bakes sweets, sugar also keep them moist and tender. it also contributes in the crispiness. so the nankhatai may become slightly dry or crumbly. in this case you need an ingredient which can hold the crumb as well as give some moisture. so something like an apple sauce or a banana puree or curd can also help. even cream can be added. but depending on the ingredient you use, there will be changes in the taste, flavor and texture of the final baked nankhatai. Can I substitute besan with something else? What exactly does besan do to this recipe?Can i do away with it completely also? it gives a nutty flavor and some crispiness. you can skip it. then add less milk while binding. Welcome Sampada. Glad to know that you liked these whole wheat nankhatais. This is awesome…. Tried it.. Comes out well.. Thank you..
hi dassana! I’ve just baked these few hrs back to be served with tea.i did use ghee & these wheat nankhatais taste good.thanks for the recipe. welcome meveera. thanks for your positive feedback. I’ve made many recipes from your blog that always turn out perfectly (idli, dosa, rice recipes, paratha etc), but never commented. But this time, I had to leave a note. Just finished making these nankhatai with my young daughter (she loved the commercial Nankhatai she ate on her first trip to see family in Pakistan, so I wanted to make her some since we haven’t been back in a while, bonus that these are made from atta!). They are perfect ! I had to put the full 4 tablespoons of milk, but I know my atta is very thirsty. And I made them with ghee. Also I added the 20 g sooji that you have in your maida nankhatai recipe because I love the texture it gives, and reduced sugar to 55 g as I always reduce sugar by 25-30% in all recipes. They turned out perfectly ! Exactly the taste I remember and perfect texture, even though some of mine overbaked because I have a convection oven and forgot to reduce the temperature. Thank you for your great work on this site, gathering authentic recipes from all over India. thank you much aisha. i am happy with all the minor variations you made, the nankhatai still turned out great. ghee gives a nice flavor and taste. thanks again for this lovely feedback. I tried this recipe. very tasty,But was too hard when it was cooled. When i tasted it after half an hr of baking outer sided were too hard and inner core was little soft.Actually I hv Bought 16 lit-Bajaj OTG a week ago only. I pre heated it on 200 degree c and then baked nankatai for 20 mins. then I checked it with toothpick,it was soft so again baked for 4 mins.Can you pls tell me,what went wrong. And as per your recipe,what shall be texture of nankatai. market bought maida made nankatais are kind of soft,easily brocken. but mine was not like that. Shall i try to bake it at lower temp and less time? 200 degree c was mensioned in BajajOTG Recipe book,so I followed that. priyanka, if the nankhatais are baked too much, then they become hard. if the inner core is soft, its fine as on cooling it will firm up. maida nankhatais are soft and crumble easily. whole wheat nankhatais are slightly crumbly, but they do have a good texture. 200 degrees is also a high temp for baking cookies like nankhatai. so you can try less temp like 170 to 180 degrees celsius. also keep both the top and bottom heating elements on and keep the baking pan or tray in the centre rack. Hi thanks for reply. I tried making it again on 180 degree c. after 15 mins. it was soft at center and not golden in color so I bakd it for 5-7 min more.How to check that cookies/nankhatai are baked properly. As for cake we check by toothpick.This time also nankhatai was hard after cooling. Shall i try it with maida? oh.. for any cookies or biscuits, the base should become golden and when you press a spoon or fork or the cookies, then it should not give its shape. if it does not show any impression of the spoon or fork, then the cookie is done. something is going wrong in the dough. try adding some more milk while binding the dough. does the dough look dry when you shape it into nankhatais? if yes, then a few teaspoons of milk can be added. also check the shelf life of the baking soda or baking powder. meaning they should be active. 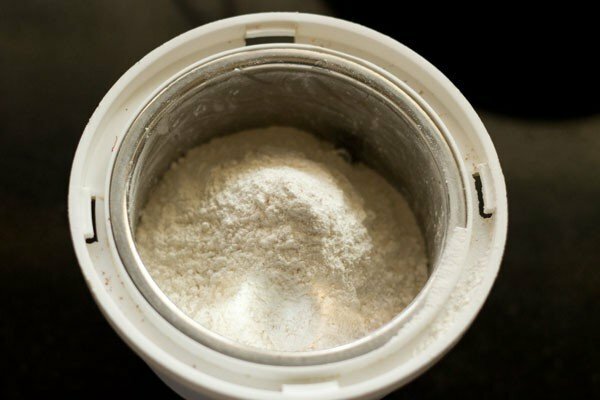 you can find on google on how to check the freshness of baking soda and baking powder. you can try with maida too. Thanks for reply,as you said ,I will check my baking soda/powder and dough texture.Will try iot again. They were so good but I don’t know why it felt like they weren’t cooked from the inside ( like they were doughie). I cooked for 25 min.Please help. what can I do? continue to bake for some more minutes. looks like they are uncooked from the center. timing varies from oven to oven. in some ovens it takes less time and in some more, so there is no standard time for any given baking recipe. I tried it today came out super awesome..this is delicious as well as healthy. thanks namita for this positive review on the whole wheat nankhatai recipe. no two oven has the same temperature. this depends on the type, make and size of the oven. so i always tell readers to keep a check when they bake anything using any baking recipe. convection ovens bake faster. so you need to reduce the time when baking. hope this helps. thanks uttara. fine, so you can bake them at 180 degrees celsius. usually convection ovens bake faster, thats why i have reduced the temperature for convection ovens. but you can even bake at 180 degrees celsius, just that the time required will be less.